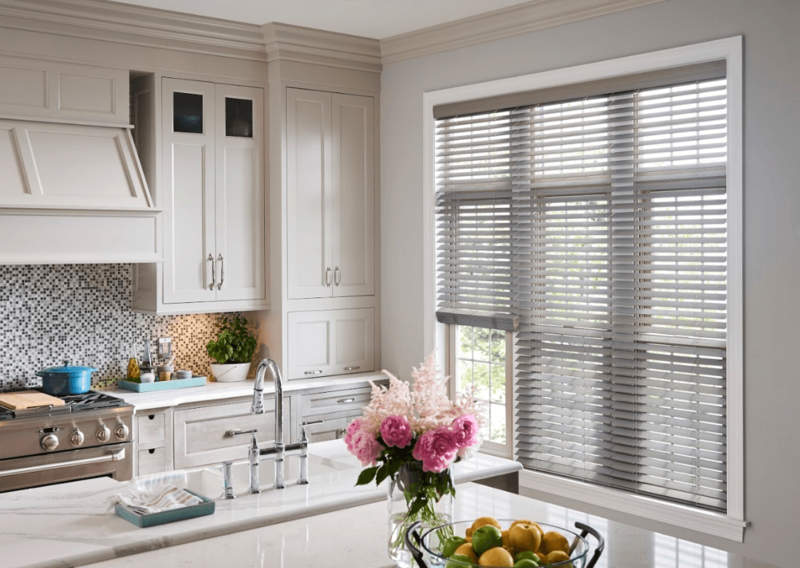 Start 2019 with eco-friendly window treatments by Budget Blinds. With our vast selection, embracing sustainability with gorgeous window treatments has never been easier. We believe in finding the perfect marriage between style and promotion of a healthy environment. With eco-friendly window treatments, you can do your part in helping to preserve our natural resources and still be on-trend with innovative products. Take a look! Through sustainable-yield forest management, the amount of wood harvested for our hardwood window treatments is below the levels of tree growth. Not only do they provide excellent privacy control, our wood blinds are a natural insulator that helps lower your heating and cooling bills, ensuring your home maintains comfortable temperatures throughout the seasons. They utilize renewable resources and environmentally-friendly forestry techniques without sacrificing style. Cellular shades, with their honeycomb-shaped cells, act as an insulator, and when combined or layered with other treatments and placed close to the glass, can reduce summer heat gain by as much as 45%. A wide range of opacity choices, from transparent to light-filtering, to room-darkening, allow you to customize natural light. And a vast selection of the latest fabrics and colors ensure a perfect match with your décor. Our woven natural shades from our Inspired Shades™ Collection are made from hemp, kenaf and flax, are 100% organic and environmentally-friendly, and completely recyclable! 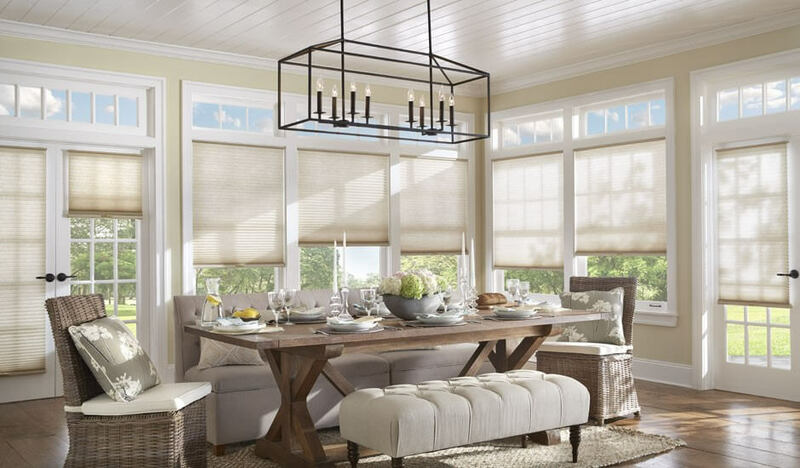 They allow for an operational roller shade on the back of the woven wood in solar, room-darkening, or light-filtering options that allow you to adjust the level of light and reduce heat gain from rising temperatures. From Roman style to a more streamlined flat style, bamboo shades combine the natural beauty of organic materials with inspired design for a refined, relaxed look to any room. 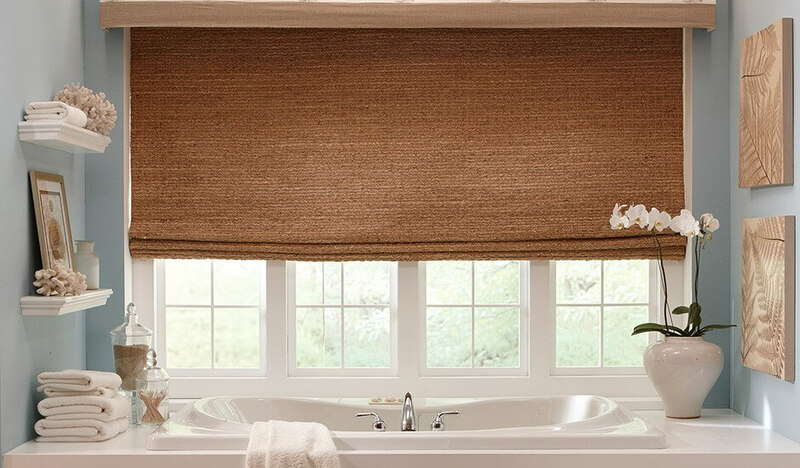 These shades fuse eco-friendly materials, including bamboo, reeds, jutes and grasses, with a variety of designs that can be integrated into the perfect customized window treatment. Start the New Year with new eco-friendly window treatments that are stylish and sustainable. We use 100% recyclable packaging when shipping our products, and most of our non-wood product components can be recycled as well. Most of our window treatments offer superb energy efficiency that help reduce dependence on electricity and natural gas for cooling and/or heating your home. Start your New Year’s shopping today with Budget Blinds! For more information contact your me today! NEED HOLIDAY GIFT IDEA’S? – CHECK OUT OUR DESIGN GUIDE! Are you stumped on gift ideas this holiday season? What better gift for your family than the gift of safety? What better gift for yourself than beautiful window treatments that save you money on your energy bill? Get all these things with new window treatments from Pamela Brown at Budget Blinds! “Going cordless” is a trend across several industries. But the movement in window coverings is not just about modern style and convenience. It is an issue of safety for homes with small children. Some styles of traditional corded window coverings pose a tempting hazard to infants and toddlers who view dangling cords as playthings. According to the Consumer Product Safety Commission, at least one child dies from window cord strangulation every month, and during that one-month period, at least one more child suffers a near strangulation. Cellular shades and Roman shades are the TOP energy-saving window coverings. Both of these styles are very trendy and have plenty of factors that help you save money on your energy bill. Cellular shades (aka pleated or honeycomb shades) are designed to create insulation by trapping the warm air inside and keeping the cold air out! Cellular shades are very versatile window treatments with a variety of fabrics and colors to choose from. We have light filtering options including sheer, light filtering, room-darkening and blackout fabrics which help with privacy and insulation too! Roman shades are like cellular shades and are one of the most popular windows coverings for energy efficiency. They are stylish and offer plenty of energy-saving qualities. They too come in a variety of colors, prints and textures to add elegance to your home. Due to heavier fabrics, Roman shades can trap in warmth which can save you money on your electric bill as you would ultimately use your heater less and less. Also, like cellular shades, Roman shades come in various degrees of light filtering options for privacy and light control. So, do I have your attention? Then it’s time to browse our Design Guide below! And don’t forget to place your orders by November 9th to ensure installation before Christmas! Visit www.budgetblinds.com/stillwater to book your appointment today! Window treatments are more than just utilitarian objects, they are fashions for your home. Picking the right ones for your home doesn’t need to be a difficult process. Budget Blinds of Stillwater is locally owned and operated by interior decorator, Pamela Brown. Pamela has been proudly serving local homeowners and businesses by providing the highest quality of name brand window treatments and the largest selection of styles in the industry. There is more to window décor than just picking a color. The window treatments you choose should be functional, make the right statement, be child and pet-friendly, and help with energy efficiency! To better understand which window treatments are best for each room in your house you must look at the material, functionality, design and overall measurements. “With me, you don’t lift a finger. I bring the store to you and take care of it all, measure and install. I believe everyone at every budget deserves style and service. And that’s a beautiful place to be!” Says Pamela. Budget Blinds has provided window covering design and installation expertise for HGTV’s Buying & Selling with the Property Brothers, the W Network’s Love It or List It, PBS’ This Old House, the Marc & Mandy Show in Canada, and NBC’s George to the Rescue. If you want the best in custom window coverings for your next window project, Budget Blinds of Stillwater is your answer. Call 651-351-7620 today or go online to budgetblinds.com and let’s get in touch! I will be offering 45% off for the remainder of September. Program your window coverings on timers to open and close at specific times of the day to save on energy costs. Energy-efficient window coverings provide effective insulation, offering your home increased protection against heat loss during the winter and heat gain during the summer. It is important to not overlook basic household items such as window coverings when child proofing your home. Automated window coverings eliminate the need for dangling cords so they are both kid-friendly and pet-safe. Making window treatments safer for homes with infants, toddlers, children, and pets is one of Budget Blinds’ top priorities. Timers allow you to open and close your window coverings on a predetermined schedule when you’re home or on vacation. Giving an outside impression as though someone is home at all times. In addition, privacy is just a click away with Smart Shades. They offer complete privacy even with the hard to reach windows. Control the amount of privacy you want in your home with automated window coverings — you won’t be disappointed! Automated shades prevent harmful UV rays from entering the room. Program your window coverings to close when the sun is shining bright to keep fabrics, rugs, upholstery and artwork from fading. Finally, what’s better than convenience? Smart Shades transform a room’s lighting and ambiance at the touch of a button. Making it super easy to lower and raise at your leisure. Monitor and control lights from your smart device no matter where you are or create personalized lighting schedules that change with the seasons. Choose from a wide array of control options such as wireless wall switches, hand-held remotes and timers, and apps that allow you to control from your Smart device. Whether you prefer blinds, shades, or drapes, all popular Budget Blinds window coverings can be automated. To learn more about automated window coverings, reach out today! When you’re considering new window treatments, don’t forget to compare the energy efficiency of different styles and materials, because the right window treatments can greatly improve your windows energy efficiency and lower your energy costs whether you are warming your home in the winter or cooling it in the summer. For example, the unique design of signature series cellular shades traps insulating layers of air and reduces heat transfer. Whether you’re trying to keep the heat out or in and when you combine that Enhanced energy efficiency with motorized controls that let you program when your window treatments automatically open and close your blinds or shades become an effortless part of your home’s heating and cooling system and with so many colors and styles to choose from you don’t have to sacrifice style for energy efficiency. Cellular shades are the TOP energy-saving window coverings. These styles are very trendy and have plenty of factors that help you save money on your energy bill. When they are closed, cellular shades will help keep in the heat and make every room pleasant to be in during the winter. For hot summer months, they block intense heat or they roll up all the way allowing for a view. Best of all, cellular shades have a cordless lift or one-touch remote control motorization making them easy to open and close as well as child safe! Contact me today to schedule your free in-home consultation and make your home stylish and energy-efficient! Preparing a home for a new baby, or modifying home décor for a growing one, is as exciting as it is essential. To ensure a child-appropriate home means not only to make room for a crib or to decorate a baby’s room with soothing, warm colors; it also means to close the electrical sockets and secure any hazardous items that are not meant to be played with. The precautions we take must be meticulous and not exclude the consideration of window coverings. As adults, we may overlook the danger of dangling cords––but small children and even pets can perceive them as hidden playthings. Choosing cordless window coverings is one of the most important steps you can take to ensure the safety of your little ones and your furry friends. Choosing new window coverings can be a daunting task. I can walk you through the various types of window coverings that are most appropriate for your home and suitable to your lifestyle, including cordless blinds and motorized shades. Motorized shades and other popular window coverings can be operated by a hand-held remote, a power-wand, a wall switch, or set on a programmable timer for extra convenience. Motorization is especially ideal for those tall, hard-to-reach blinds, and for windows directly in front of furniture, such as dressers or cribs. Whether you prefer the classic look of traditional blinds and shutters or the modern appeal of curtains and shades, most Budget Blinds window coverings can be motorized. Schedule a free in-home consultation with me and I will bring samples of cordless blinds in a variety of styles, colors, opacities, and textures, directly to your home so you can see how they will look with your family’s existing décor. By making your home’s window blinds cordless, you protect your family from risks of entanglement or even death. The Window Coverings Manufacturers Association (WCMA) announced that a new window covering safety standard is set to take effect on Dec. 15, 2018. Budget Blinds has always promoted child safe window covering products. Our Home Office teams have worked diligently with all our vendor alliance partners to ensure they are in accordance with all safety regulations including those advanced by the WCMA and Health Canada. That’s 100 percent of our alliance manufacturers providing child safe products. And, we’ve been aligned with the WCMA for nearly twenty years. Taking it a step further, 80 percent of our vendor alliance partners are participating in WCMA’s “Best for Kids” program. This safety program is voluntary, and products must be submitted to a WCMA-recognized third-party testing laboratory. Products that meet stringent criteria will be eligible to be listed and labeled on packaging and materials as “certified” Best for Kids. To learn more about how Budget Blinds meets or exceeds these heightened child safety window covering standards, schedule a free in-home consultation with me, today!